Dumbo and Pinocchio have never been Disney classic favourites of mine. I haven’t been able to sit through them again in my adulthood (even though I’ve tried), they’re just too odd, uncomfortable and depressing. 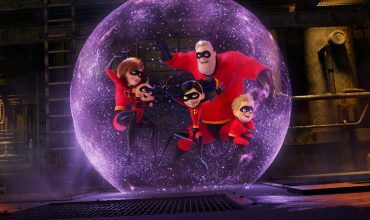 Disney’s Live action ‘take’ on the animated classic maintains a few of the key elements of it’s predecessor, but ultimately goes a different and possibly more absorbing route. The focus is no longer on Dumbo alone. Screen time is shared (and sometimes hogged) by the circus family of humans around him and the main plot points are taken into their hands. The morals highlighted through the story have also been given a modern coat of paint – as I don’t recall animal welfare, female empowerment or being a good Dad being the foremost lessons of the 1941 classic. The most important of which being: No animal deserves to be kept in a circus – unless it’s a horse. 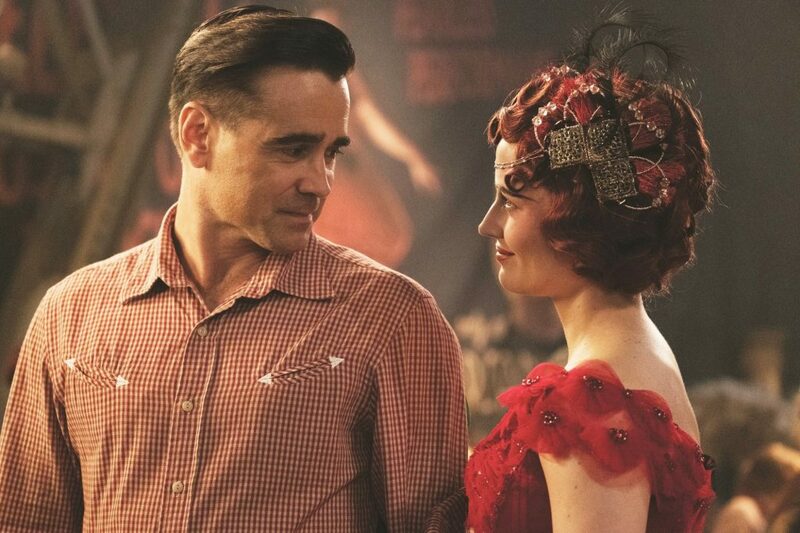 Colin Farrell is actually pretty great as Holt Farrier (if you can over-look the classic ‘Dad who doesn’t know how to talk to his kids’ trope being dragged out in as many scenes as possible). Newly returned from the war, he doesn’t quite know how to adjust to the changes he finds at the circus he once called home. With his former status as the biggest draw-card of the circus and security of having a perfect wife to do all his communicating for him gone, he has to find his footing again in life. Nico Parker and Finley Hobbins play his children Milly and Joe, respectively. They were decent. 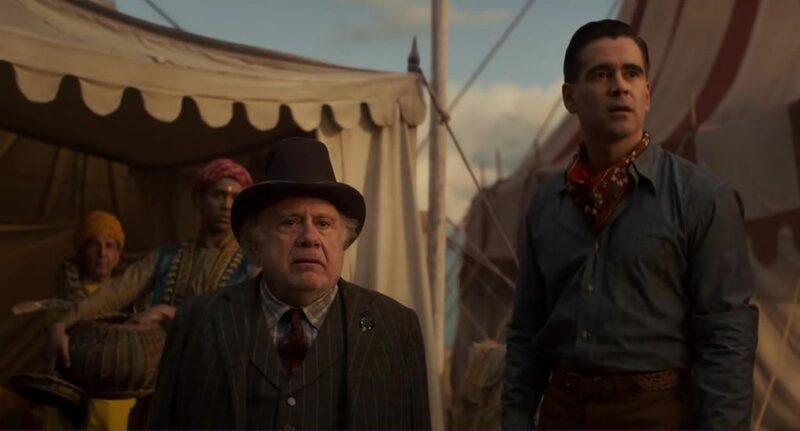 Danny DeVito was absolutely perfect in the role of Max Medici, the circus owner. I don’t think I’ve ever not loved him though – so if you’re not a Danny DeVito fan – well, whoop-dee-doo! The villain of the story was pretty interesting, though. Michael Keaton managed a decently unsettling performance as V.A. Vandevere, a wealthy amusement park owner (kind of a twisted version of Walt Disney). Joseph Gatt was your classic evil henchman with elephant skin boots who wastes an obscene amount of time chasing children around for no good reason (as if this movie isn’t terrifying enough for kids already). Eva Green does what Eva Green does best. Looks stunning and acts mysterious with heavy eye make-up on. There were plenty of other pleasant enough and not so pleasant characters who made up the endearing circus family, each with their own ‘quirk’, but none given enough time to really have an impact. The elephant animation was very impressive. I guess it’s easy to take good animation for granted these days, though. I was about to blitz through this review without giving it so much as a mention! 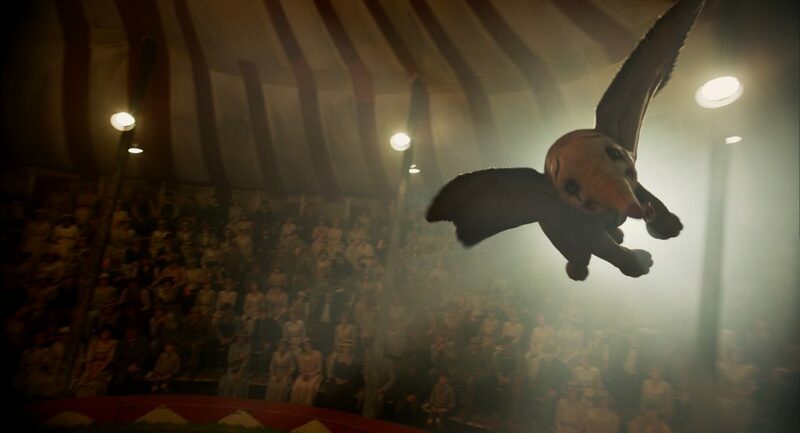 Dumbo felt very ‘real’ and there wasn’t a moment where they ‘humanised’ his expressions too much or made him act too ridiculously – and broke the movie magic. I was absorbed in the story from start to finish. 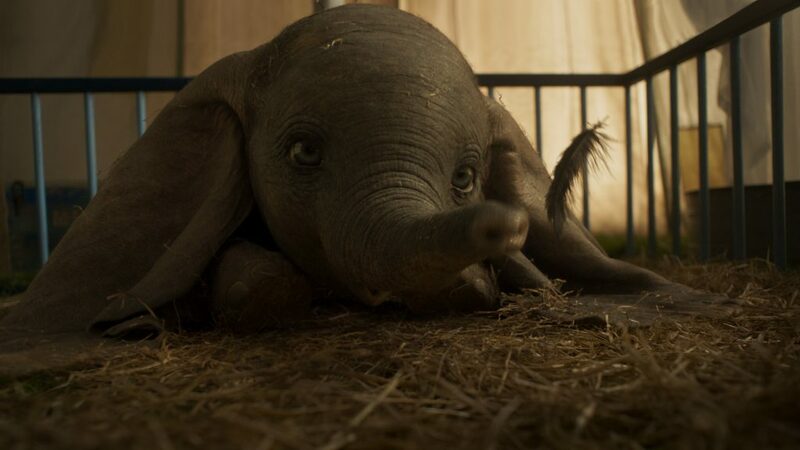 Dumbo is going to win hearts, for sure. Something I must address, however, is the ‘Tim Burton directs Disney effect’. I don’t really know who this movie is for. 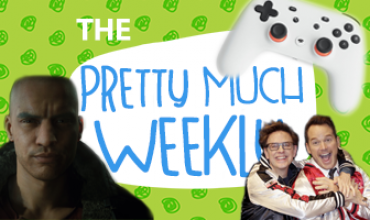 There were far too many jump scares (yes – actual jump scares), creepy moments, intimidating characters and sad themes (yes there is a ‘Baby Mine’ scene. No, it isn’t as emotive as the original) for this to be a suitable kids flick. If you don’t believe me, just ask the multiple children who were balling their eyes out in the screening I sat through. However, it’s also not going to win with an older audience either, due to the sometimes painful family film tropes. It might be perfect for families with slightly older kids (maybe 8+? ), or parents who are prepared to reassure their kids over and over that they’re sure Dumbo’s mummy won’t actually be made into a pair of boots. 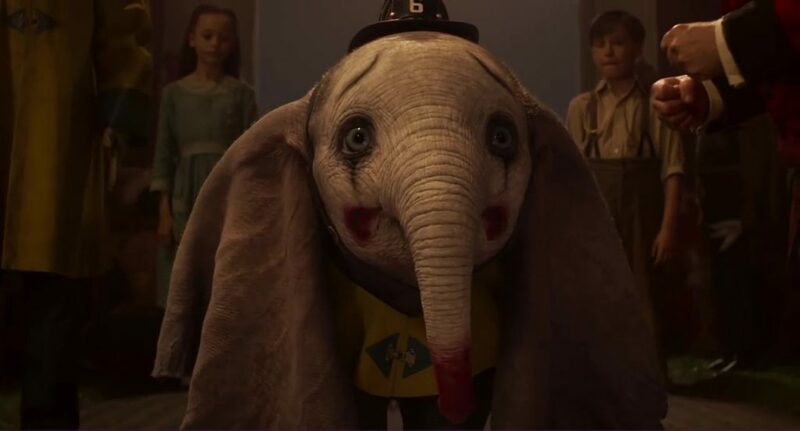 Disney’s live-action remake of Dumbo lives up to the hype! Dumbo, the baby elephant with big ears, is teased for looking different. But his big ears are what allow him to fly! This story teaches us that it’s okay to be different! It means embracing your uniqueness, which is a wonderful thing. While the film does not include talking animals like the original, you get a strong sense that the animals truly understand the humans. In true Tim Burton style, the movie feels a little dark and may be scary and a bit sad to the younger ones – actually – the little girl sitting next to me in the cinema cried a few times throughout. But those of us who watched the original will find it’s not quite the tear-jerker we expected it to be. Unlike most of Disney’s remakes, the story does not follow the exact plot line as the 1941 version – and for good reason too, as we remember the awful racist portrayal in the animation. A Dumbo movie without that would be way better to watch. The plotline goes beyond the original film, taking off from when Dumbo learns he can fly. Overall, Dumbo is a fantastic remake – the amazing graphics really take you to “dreamland” and gives you a sense you are almost in the same universe but a more realistic one, as Alice from Tim Burton’s Alice in Wonderland. It’s the Disney remake we all needed. And that’s why you should watch it!